HBO movie about Temple Grandin wins another award – a Golden Globe. Thought it would be a good time to share my interview with Temple at the Acres USA conference. Hope you enjoy it and learning more about this fascinating lady. What do neurologists, cattle and McDonald's have in common? They all owe a great deal to one woman, a renowned animal scientist born with autism, Temple Grandin. Though she didn't utter a word until close to her fourth birthday, substituting screams for forming words, she splashed onto the stage of public awareness in 1995, thanks to the vivid, sensitive writing of the neurologist Oliver Sacks. Little was known about autism at the time except that people so afflicted appeared socially isolated, emotionally fragile and difficult to engage. But as with many psychological disorders, autism is a spectrum, and Temple, 62, is on one edge. Living on this edge has allowed her to be an extraordinary source of inspiration for autistic children, their parents — and all people. She is also a source of hope for another mammal: the cow. 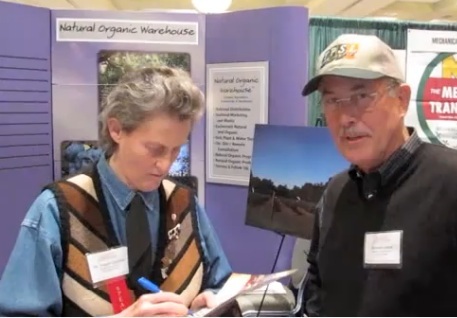 Using her unique window into the minds of animals, she has developed corrals for cattle that improve their quality of life by reducing stress. And though the fast-food industry continues to use cattle in its patties, it has come to appreciate the ethics and compassion of a Grandin burger. 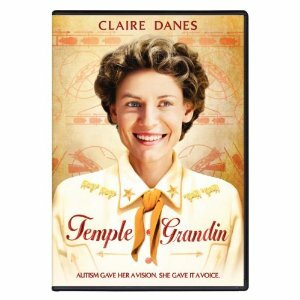 Claire Danes, the actress who portrayed Temple Grandin, Ph.D., in HBO’s biopic “Temple Grandin,” was awarded a Golden Globe for her performance at Sunday night’s award show. The movie, which paints a picture of Grandin’s perseverance while struggling with the isolating challenges of autism and profiles her groundbreaking work in animal handling, was nominated for three awards including best movie, best actress and best supporting actor. Click here for reservations and information.